A few years ago, Dion Floyd of Aquaryus Entertainment approached me about a project that would include several Black Indie Comic Book characters. Oddly enough, my character is from a series of soon to be released stories. However, it garnered the attention of quite a few people during a unsuccessful Kickstarter project. So Dion thought GlyphX was unique enough to be in his project and I was up for the collaboration. 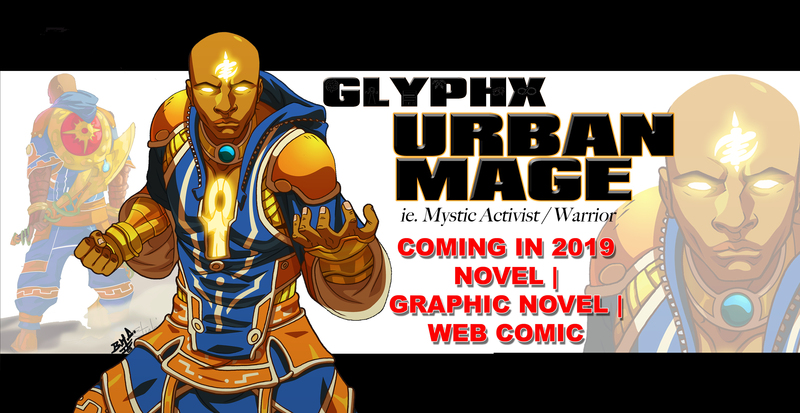 GlyphX is visually appealing, (shouts to Shawn Alleyne/Pyroglyphics Studio) who was able to piece together 100% of my ramblings and detailed descriptions of the character to be called GlyphX. Also, shouts to Luis Guerrero who took my color scheme and amped up the quality. So here is the first of few appearances, that GlyphX will be featured in outside of my own projects. STARFALL: The Undoing is a great project, story and artwork. Check for the release this year and we thank you for your $upport! StarFall: The Undoing issue 1 cover. Art by Sean Hill and Colors by Omi Remalante. Written by Reese Robertson and Dion Floyd, Letters and prepress by Ed Dukeshire © 2014, 2018 Aquaryus Entertainment. GlyphX created by Ced Pharaoh and appears courtesy of NKOSI Publishing. Added bonus look, here is an early promo poster of three of the characters to be seen in the project, STARFALL: The Undoing. Starfall: The Undoing written by Reese Robertson and Dion Floyd. Dreadlocks© created by Andre Batts and appears courtesy of Urban Style Comics. Michael R. Sloane© created by Adalberto McFarlane and appears courtesy of Nine Nappy Publishing. GlyphX© created by Ced Pharoah and appears courtesy of NKOSI Publishing. ©2014,2015 Aquaryus Entertainment. Artwork by Alberto Foche.